Everybody does it! It's New Years Eve and you promise yourself that this year is the year that you lose weight, get back in shape and (maybe) spend less time on Snapchat. You've made these resolutions before, but THIS TIME YOU MEAN IT! Here are some tips for keeping those New Years resolutions strong though the entire year. Sure, it would be great to lose 25 pounds by swimsuit season, but what are the chances of that? Setting a resolution that is so clearly out of reach only sets you up for failure, and you will admit that to yourself before the party mess is cleaned up on January 1st. Instead, make a reasonable and achievable goal, like losing 5 pounds by summer. Then you can build on that success and possibly set a new stretch goal for the rest of the year. Don't resolve to learn a new language (for example) if there's no payoff when you succeed. Most resolutions involve some level of effort, so there must be some reward waiting for you upon completion. If you can't answer the question "Why bother?" you will never build up any enthusiasm for making this resolution happen. Yes, we all want to "get back in shape" as the ball starts to drop, but what does that really mean? If you can't measure your success, you are doomed to failure. How about "I will walk for 20 minutes at least 5 times a week" or "I will lower my cholesterol by 15 points" instead? Remember that joke from second grade, "How to you eat an elephant? One bite at a time!" Take your achievable, relevant and measurable goal and break it down into bit-sized chunks. Want to lose 5 pounds by May? That comes down to a smidgen over a pound a month. Make that your mini-resolution and celebrate your mini-success every month. Success breeds success, so that first month's weight loss will buoy you up and make the second month's dieting easier to handle. A little ahead or behind after month two? That's not the end of your resolution, merely a bobble that you can easily correct before the end date. The journey of a thousand miles begins with a single step. Celebrate that step! Tip 5: Don't go it alone! OK, so this one's my favorite, of course. We are much more willing to let ourselves down than disappoint others. That's where WannaBuddy comes in. Find yourself a buddy to join you in your resolution. 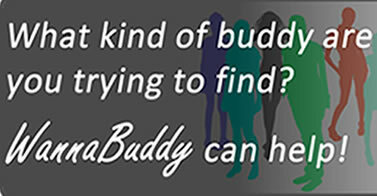 Need a walking buddy? A diet buddy? Check out the site, find a new buddy (it's free), and get some mutual support and encouragement to keep that resolution going all year long. So enjoy your New Years celebration, stay safe, and keep these tips in mind as midnight approaches.